Blog entries tagged with "road rules"
Today was was my first time riding to work in too long and although there was plenty of light, as I rode on the suspended section under the freeway near Kooyong I was reminded of something that annoys me because it can be dangerous: a slow flashing front light. On its face this is all reasonable, my particular issue is with the word “flashing” because it doesn’t indicate how slow or fast the flash should be. I prefer a fast flash as it draws your attention, but is still continuous enough that you can follow where it is, especially when there is a bend or obstructions. On the other hand a slow (where you can notice the delay) flash I find to be dangerous as you may not have seen enough flashes to get an idea of the direction and speed the bike is moving, before you need to allow for the direction to be changing because of a bend or curve in the path. The compounding factor with this morning’s example was that it was also a super bright light. The sun wasn’t quite up and the freeway casts a decent shadow, it isn’t good to be faced with a blinding intermittent light on a narrow path with metal railings on both sides. What is a bicycle lane? While this still involved a decent hill, it was fairly steady and didn’t have anywhere near the traffic of Blackburn Road. What wasn’t clear was whether Pinewood Drive had bicycle lanes. There were no signs or markings, just wide parking lanes, yet the council’s maps of bicycle paths (local copy) showed it as having on-road marked lanes. In February 2011 I contacted the council and then in April 2011 they painted bicycle logos. 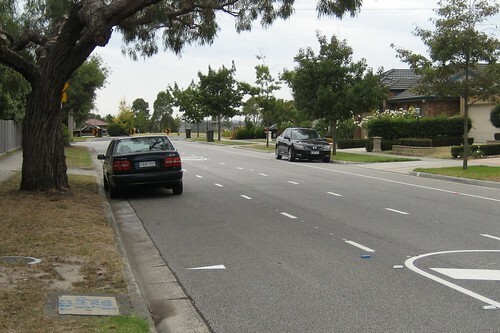 However they never installed signs, which means they were not legally (according to VicRoads information) bicycle lanes. For a week after they painted the bicycle logos I used the “lanes” but after three near-doorings I didn’t use them again, but I continued to ride along Pinewood Drive. 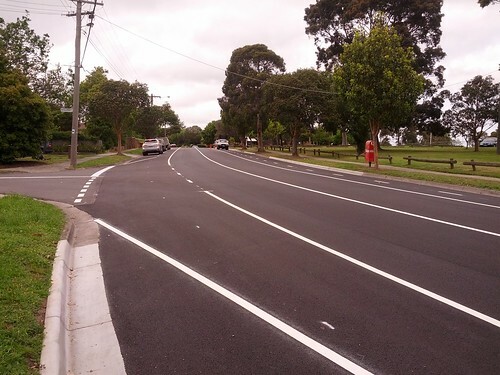 A few weeks ago the council resurfaced Pinewood Drive and once they started to mark our for new lines I asked the council via twitter if the new lanes would continue across intersections. The answer was yes. But once they started marking the actual lines I realised my question was too narrow. Instead I should have asked if they would follow current design standards in general, not just one specific part. It isn’t as if the council’s Walking and Cycling Strategy (local copy) – adopted 30 April 2013 – has a section (6.3, page 22) about ensuring consistent design standards. Oh wait, yes it does. 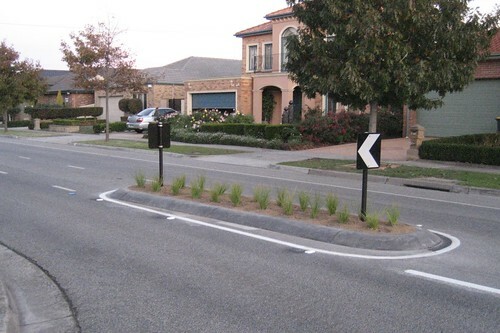 See page 14 for ‘Ensuring consistent design standards’ and action item 18 references Austroads and VicRoads guidelines. 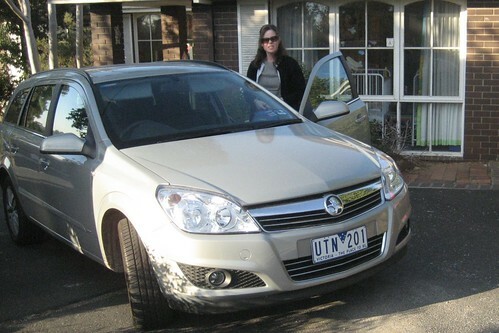 Those guidelines are available online: VicRoads – Design Standards for Bicycles and Austroads Guidelines. I haven’t bothered to register to get the free PDF download from Austroads, since the Cycle Notes No. 12 – Design Standards for Bicycles (local copy) looks to have sufficient information. To me it provides a pretty good overview of how a modern bicycle lane should be marked out. So what issues do I see? 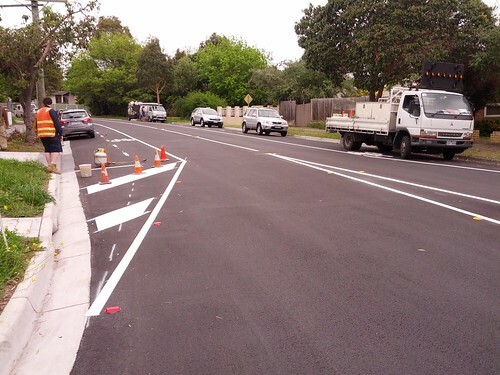 installing bicycle lane signs – not yes, maybe they will be installed this time? Bicycle logo is not at the start of the lane. The end of the bicycle lane (under the painters truck on the other side of the road) does not end of a short length of continuity line. Why is the end of the parking bay angled, not squared off as in the diagram? try to overtake in one of the gaps between the islands. I sure hope that they choose the first option, there is not space for the second. night means the period between sunset on one day and sunrise on the next day. This means that in Melbourne tomorrow you must not drive your car after 5:38PM without turning on your headlights. The other aspects of this rule is about weather causing reduced visibility. I have yet to find a clear definition of this, but to me this is situtations where fog makes it hard to see, rain (even very light rain) makes it hard to see, heavy cloud cover makes it hard to see, etc. Because as a road user (both as a cyclist and car driver) I see a large proportion of other road users that do not know this rule. This is important because at night in busy traffic, what is the difference between a gap in the traffic and an idiot without their headlights on? I’m annoyed with the Victorian Police at the moment. near as practicable to, the centre of the road. So there I was: riding to the left of the centre of the road and indicating right. So what did the car do?